Gemini® Laser - Products - Procedure - Ultradent Products, Inc. The Gemini 810 + 980 diode laser is the first dual-wavelength soft tissue diode laser available in the United States. The unique dual-wavelength technology combines the optimal melanin absorption of an 810 nanometer wavelength diode laser with the optimal water absorption of a 980 nanometer wavelength diode laser. The Gemini 810 + 980 diode laser is also the most powerful dual-wavelength soft tissue diode laser available. The laser features 20 watts of peak super-pulsed power, which means faster, smoother cutting with less tissue tagging. ​The Gemini 810 + 980 diode laser is a dual-wavelength soft tissue diode laser that can be used intraorally for frenectomies, gingivectomies, and other soft tissue procedures. Most instruments in dentistry provide tactile feedback, but diode lasers are a bit different. This video explains the best technique to use with soft tissue diode lasers. Earn 3 FREE CE credits from www.ineedce.com by reading this article and taking the quiz at the end. Can be completed online. Code: ULTLASER good for 100% off and valid through 4/15/2019. CE credits provided by Pennwell. What procedures can the laser be used for? ​The Gemini 810 + 980 diode laser is cleared by the FDA for 30 different soft-tissue surgical procedures as well as the treatment of aphthous ulcers and herpetic lesions. Can the Gemini 810 + 980 diode laser perform any new procedures that other soft tissue lasers cannot? ​No; however, the Gemini 810 + 980 diode laser will perform procedures more quickly and smoothly than other diode lasers without causing additional collateral damage. This is due to the laser’s unique 20 watts of super-pulsed power and long thermal relaxation periods. The Gemini 810 + 980 diode laser also offers increased clinical versatility by combining the two most common diode laser wavelengths (810 nm and 980 nm) to maximize both water and melanin absorption. ​Dual wavelength technology combines the optimal melanin absorption of the 810 nm wavelength with the optimal water absorption of the 980 nm wavelength. Do both wavelengths operate simultaneously, or does the dentist select a wavelength based on the procedure? 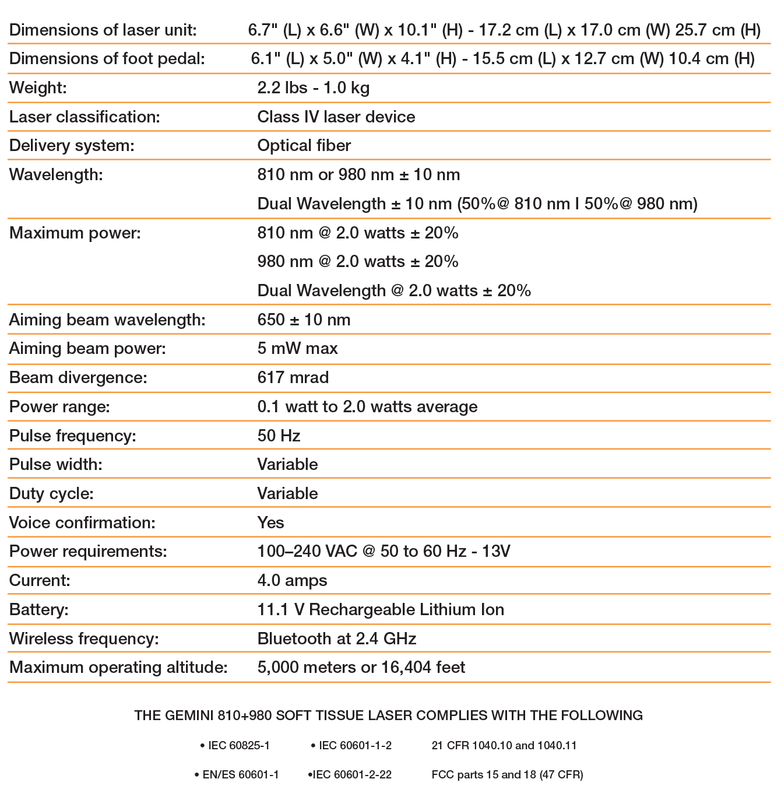 ​The Gemini 810 + 980 diode laser is really three lasers in one system. It can operate in single-wavelength mode with 810 nm or 980 nm alone, or in dual-wavelength mode which combines the 810 nm and 980 nm wavelengths into a single laser beam. Operating in dual-wavelength mode also allows for the maximum peak power of 20 watts for faster, smoother cutting. Why are the melanin and water absorption significant? ​Surgical diode lasers operate by heating soft tissue molecules to vaporization temperature (100–150º C). The target molecules—hemoglobin, melanin, and water—absorb laser energy at different rates depending on what wavelength is used. The two most common wavelengths found in dental diode lasers are 810 nm and 980 nm. The 810 nm wavelength is absorbed in melanin at a higher rate than 980 nm, and the 980 nm wavelength is absorbed by water at a higher rate than 810 nm. There may be some clinical situations where a single wavelength is preferred over another, but we recommend using the Gemini 810 + 980 diode laser on dual-wavelength mode to maximize absorption in both melanin and water. Does the Gemini 810 + 980 diode laser run off continuous wave? What does super-pulsed mean? ​The Gemini 810 + 980 diode laser does not run off continuous wave. It is a super-pulsed diode laser. All other laser and phototherapy technologies utilize either continuous wave or standard pulse, which merely chops the beam. While continuous wave and standard pulsed lasers can be effective, they do not deliver the same the quality, quantity, and depth of penetration of photonic energy as super-pulsed lasers. Super-pulsed lasers can safely deliver optimal amounts of photonic energy without generating excess heat that could compromise safety. Super pulsing allows for deeper penetration than a laser of the same wavelength that is not super pulsed. This is because short pulses allow for quick absorption at the cellular level. What comes with the purchase of a Gemini 810 + 980 diode laser? ​No, the disposable tips are intended for single-use only and must be disposed of after each patient use. The tips come individually packaged in a box of 25. The tips are available 5 mm and 7 mm lengths and are 400 microns in diameter. The 5 mm tips come pre-initiated and the 7 mm tips are uninitiated. Is the unit battery operated? What kind of battery does it use? Is the battery rechargeable? ​Gemini can be powered by external power or by its internal lithium-ion battery. The battery takes 60 minutes to charge when empty and will supply power for 90 minutes of use when full. The foot pedal uses AA batteries. Are there any installation requirements for the operatory? ​No, there are no installation requirements. Is any additional hardware necessary? ​No, all of the items you need to get started are included with the purchase. What are the steps for troubleshooting any issues? Step 1: The User Manual includes a section on service and troubleshooting. Please see page 39. Step 2: If the issue cannot be resolved using the troubleshooting guide, you can call Ultradent customer service at 800.552.5512 extension 4574. Step 3: If you require further customer support, the Gemini 810 + 980 diode laser features a unique remote support feature that allows an Ultradent equipment specialist to diagnose the problem remotely when you plug the unit into a computer’s USB port. The Gemini 810 + 980 diode laser includes a two-year warranty. Will software updates be available? If software updates become available in the future, the Gemini 810 + 980 diode laser can be updated remotely without the need to send the laser back to the manufacturer. The process is the same as the process used for remote support. Does Ultradent offer any training on how to use the Gemini 810 + 980 diode laser? Is there certification available? There are multiple organizations that offer training and certification. We encourage you to find a training course that suits your specific needs. The following are three options of organizations that will provide discounted training to Ultradent customers. What type of training does my state require for dentists and hygienists? ​Each state has different regulations for how lasers should be used in practice. These rules change frequently for both dentists and hygienists. We encourage you to consult your state laws when determining your training requirements. Your Ultradent Sales Representative will be able to provide direction on where to find this information.